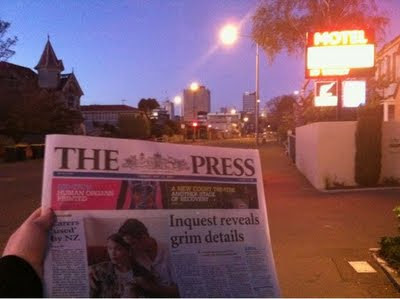 So what is happening in Christchurch? 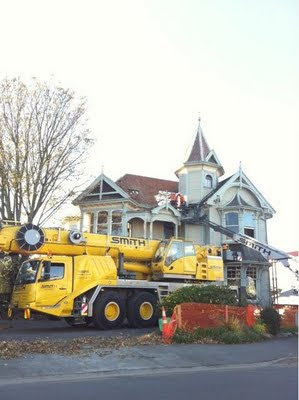 Over many years, many people have photographed the beautiful Edwardian Wharetiki house over the road from us at 854 Colombo St.
Today it took pride of place in our morning picture, reflecting the work started on it the day before. It was clear that its days were numbered. Sad, cos we kind of liked it, so much so that we had even given it our own name. We called it the Munsters’ House. A year or so ago it was covered in The Press when it was for sale. 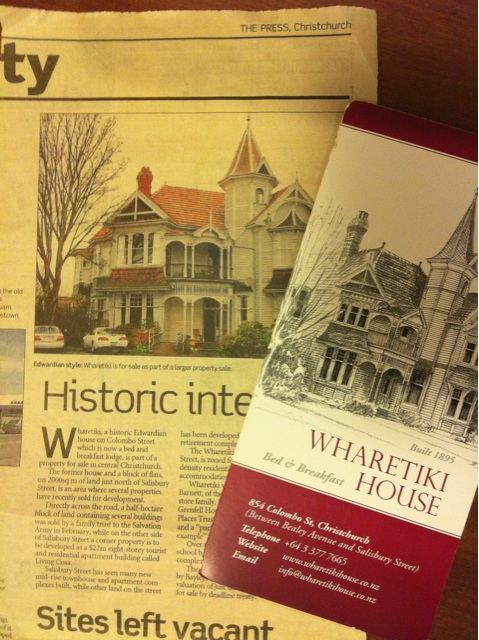 It’s on 2000sq m of land and was built in 1904 according to the article but 1895 on the Wharetiki House B&B info pamphlet. Either way, it’s old and nice. It was built by Matthew Barnett, whose family owned the Arthur Barnett department store. Over the years it has been a school boarding house, an apartment complex, a guest house and a pre-school. It was valued at around $2 million. That was until 4 Sept., 2010. In that quake the massive 4 birth chimney collapsed and plunged through the roof but did not cause any other visible damage. 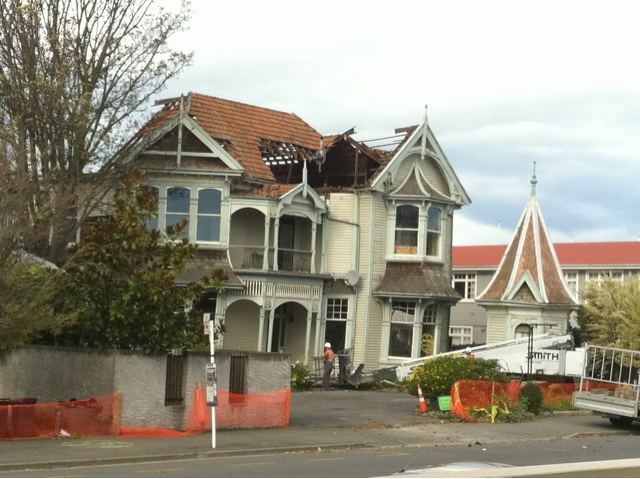 But after the 222 quake, the whole building took on a very noticeable lean and rattled loudly with every aftershock. As mentioned in previous blogs, it was red stickered, meaning its future was probably uncertain. 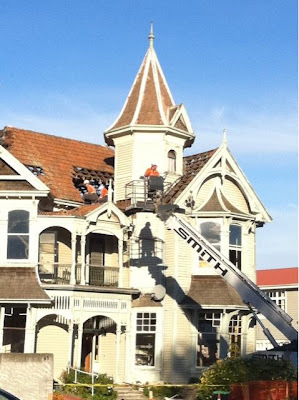 Late last week there was movement on the property and yesterday morning work started to remove the turret. This was completed in higher than comfortable winds today but the turret is now safely on the ground. I was able to talk with the owner who is hoping to be able to use parts of the building in a new building to be built on the site. It would be great to see some of the former beauty of the building gracing the new Christchurch!